It’s hard not to be at least a little skeptical whenever a new wacky physics-based indie puzzle game hits the market. Games like Goat Simulator or Octodad were happy accidents and trying to replicate their style, and definitely their success, is a lot more difficult than most folks realize. More often than not you end up with bad cynical cash grabs like Catlateral Damage. But sometimes you can still end up with genuine magic such as the case with Human: Fall Flat. Human: Fall Flat is the “smart” wacky physics-based puzzle game with genuinely clever puzzles and great levels along with the unpredictable nonsense that makes these sort of games so fun to both play and watch. Keep reading for all of the details in our full Human: Fall Flat Xbox One review. Human: Fall Flat is a physics-based puzzle game where you control a customizable dough boy looking “human” and guide them through 3D worlds in order to reach an exit door. At first, the worlds are small and the puzzles simple, but they get bigger and more complex as the game goes on. There are less than ten levels total, but it will still easily take you 5 hours or so to finish them all the first time. And you can add on a few extra hours if you want to try to get all of the achievements and find all of the secrets the game has to offer. 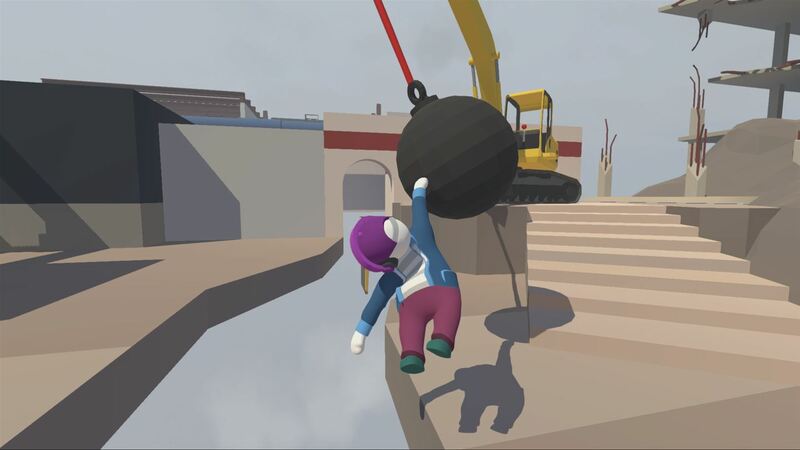 Human: Fall Flat isn’t a game you’ll finish once and never play again, however. Each puzzle usually has multiple solutions and thinking outside of the box to figure things out in clever ways is a blast. In fact, sometimes you don’t even have to solve the puzzles at all and can just climb over walls and skip entire sections of the levels entirely. Human: Fall Flat gives you almost total freedom to do things however you want (kind of like Prey 2017 minus the aliens) and it is awesome. It all gets even better when you add a second player to the mix in local co-op. Having two people working together gives you even more options to solve puzzles in new and interesting ways. Co-op is also where some of the funniest and weirdest stuff happens as two players flail around trying to do stuff, so it’s definitely the recommended way to play. So what about the actual gameplay in Human: Fall Flat? As I mentioned, it is a 3D puzzle game where you solve physics-based puzzles. You move your character around with the left stick, control the camera with the right stick, jump with the “A” button, and use the left and right triggers to grab and hold onto stuff with the character’s hands. The camera position also controls where the hands are moving and grabbing so, for example, having the camera straight behind the character makes them reach directly forward, or pulling the camera down low makes their arms reach high into the air. With these simple controls your character can move around, jump, grab ledges and pull themselves up, pick up items, and more. It’s all pretty intuitive once you wrap your head around it, but it is also undeniably awkward as your floppy character doesn’t always do quite what you want them to and sometimes the physics can be unpredictable. You’ll think you’re executing something properly but a window just won’t break or a board or something simply won’t move how you want. This can be frustrating, but it never got to the point where I wasn’t having fun. The awkwardness in the controls is part of the game’s charm and accomplishing great things with a floppy dough person is very satisfying. Frankly, if the game had super precise controls it just wouldn’t be nearly as interesting or fun. Read our review of similar 3D climbing / platforming game Grow Up. 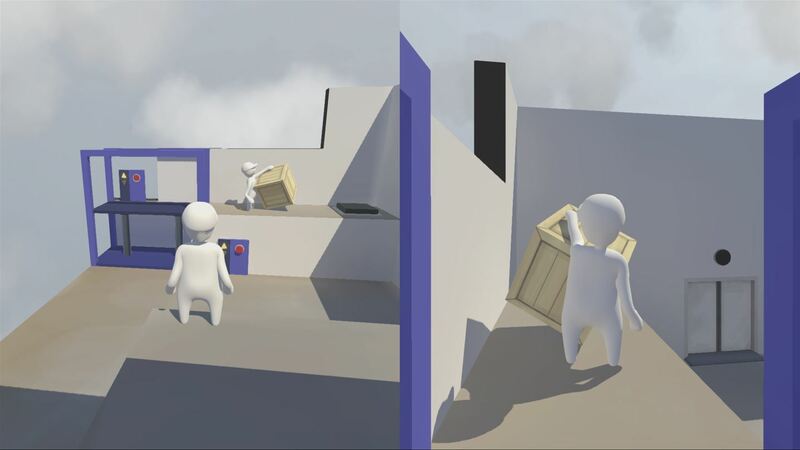 The presentation in Human: Fall Flat is fairly simple, but very appealing. The 3D worlds are made up of solid colored polygons with no textures, but the visuals are clear and sharp and consistent so you always know what you’re looking at. The minimalist style is totally appropriate and works well here. I also like the subtle use of sound and music while playing. There isn’t a rousing soundtrack accompanying your actions, but rather more ambient environmental sounds that give the game a dreamlike feel. I like it. All in all, Human: Fall Flat is a fun and fresh take on physics-based puzzles that we had a great time with. The wide variety of puzzle types and multitude of different ways you can solve them all make for a very satisfying experience that players of just about any skill (or cleverness) level can enjoy. Add in a second player in local co-op and a while new layer of strategies and solutions opens up and the game gets even better. If you enjoy puzzle games and / or you’re looking for a new co-op game (give Manual Samuel a look too, while you're at it), Human: Fall Flat is pretty easy to recommend. Buy it.